If you are planning to renovate your home by painting over your existing oil based paint, it is important to know if the two paints are compatible. If you are unsure, you can pour some denatured alcohol on the rug and rub the wall surface. If the paint does not come off on the rag, it is oil based. If some of the paint comes off, it is latex. Here are some tips on how to paint over oil based paint to get the ideal outcome after your repainting job. Oil Based Paint Vs. Water Based or Latex Paint, Which One is Better? Oil based paint is more durable than latex paint. It levels flat on the surface and leaves no brush marks, bubbles, and gaps. However, it takes longer to dry and the cleanup procedure is quite difficult. Also, this type of paint is not that easy to purchase in higher quantities from most hardware stores and home improvement stores because it has a volatile organic content, or VOC, that emits harmful toxins to the environment. Although it is not as durable as oil based paint, most homebuilders prefer latex paint because it is easier to work with and dries more quickly. It is good for general painting and renovating projects. Make sure to purchase high-quality latex paint for the best value for your money and a better paint finish. Can I Use Latex Paint Over Oil Based Paint? Yes, you can use latex paint over oil based paint. It is compatible with the oil based paint. However, the surface to be painted should be properly prepared. Can I Use an Oil Based Paint Over a Water Based Paint? The truth is, you cannot just paint over water based paint with oil based paint directly. If the sealing coat is used to separate the layers, then you can proceed with painting over the latex with oil based paint. 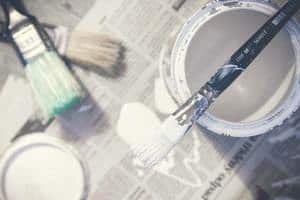 For this guide, we’ll assume that the existing paint is oil based and you are painting it over with a new one that is either latex or water based paint. Rug and denatured alcohol for testing the existing paint. Wear protective pieces of equipment such as gloves and mask because paint can irritate the skin and emits fumes that can be dangerous to your lungs. Inhaling the fumes or too much exposure to paint can cause headaches, dizziness, and nausea. You can also wear an overall to protect your clothes while painting. Before you begin, the surface must be properly prepared. Remove the gloss finish of the surface by sanding with good quality sandpaper, preferably one with 180 to 220 grit. Dip a sponge in a solution of water mixed with trisodium phosphate or TSP to clean the surface. Make sure you also remove any dirt, mold, and mildew that may affect the paint’s ability to stick. Use a tack cloth to remove any remaining specks of dust. A tack cloth’s sticky surface is a perfect product for vacuuming up remaining motes of dust. Just remember not to apply too much pressure when rubbing the surface or else it will leave some surface wax that is quite hard to remove. Apply your preferred high-quality primer and allow to dry. The primer provides a great base for further coating. There are also oil based and water based primers available. In certain cases where the surface is made of plaster it will be too flaky or powdery and a special type of primer must be used. You have to figure out the type of surface that is compatible with the primer for a good base coat. Then you can start painting with your choice of latex paint. Start with a base coat of high-quality latex paint. When dry, apply another coat. Although you can use oil based paint over latex paint, the latter is not an ideal base for oil paint due to its built-in flexibility. A good result is quite tricky to achieve because of its hard finish. As any DIY projects, the key to success is paying attention to preparation. Do the first stage of sanding. As mentioned, oil paint won’t adhere properly if applied directly. It is important to sand the entire surface to achieve a suitable surface for oil paint. There should be no remaining shiny areas that will cause problems in the future when it is time to apply the oil paint. Wipe away residual dirt and dust with a damp cloth and allow to dry. Mask the surface. Masking the edges provides protection to adjoining walls when applying the paint. Use a water based or latex primer. This provides a good base coat because water is compatible with both latex and oil based paint. When the first coat is dry, apply a second coat of primer to further isolate the existing or original surface. All traces of latex paint should be covered. Apply the first oil based top coat. When it is dry, you can apply further coat for maximum coverage. Remove all masking tape while the paint is still tacky. To give you further tips and ideas on how to paint over your oil based paint, watch this video. So that is how to paint over oil based paint using latex or water based paint. Repainting is one of the best ways to revamp the look of your house. Keep in mind that knowing your existing paint is essential in choosing the type of paint to use over it. Follow instructions, pay attention to details, and practice caution. Remember that preparation is the key to success in almost all DIY jobs. Choose the best quality of paint to achieve a good result that looks professional and prevent problems in the future.